Doston, watermelon ek delicious and refreshing fruit hai . Ye hamari health ke liye bhi bahut beneficial hai. Per cup watermelon me 46 calories hoti hain, lekin ye high in vitamin C, vitamin A aur many healthy compounds hota hai. Studies me dekha gaya hai ki watermelon ka sewan karne se obesity, diabetes aur heart disease ka risk kam ho jata hai. Iske other benefits me healthy complexion and hair, increased energy and overall lower weight me help karta hai. High blood pressure or hypertension heart attacks, strokes aur other diseases i common conditions hain. 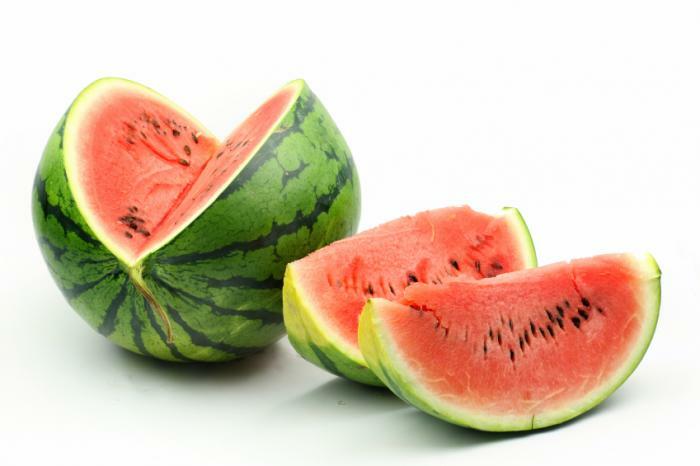 Watermelon yani tarbooj me carotenoids present hota hai, ye arteries aur veins ki hardness ko rokne me help karta hai. Isse blood clots aur atherosclerosis risk reduce hota hai. Tarbooj aur iska juice actually aortic blood pressure ko reduce karta hai aur hamare heart ko bhi healthy rakhne me help karta hai. Humans me oxidative stress ek common problem hai aur ye usually antioxidants ke imbalance se hoti hai. Jitna hum ise ignore karte hain ye utna hi increase hota hai. Waise hamari body aur hamari life me is process ko reduce karne ke many ways hain. Stress se DNA, protein aur membrane damage hone ke risk hote hain. Isliye ye bahut necessary hai ki stress ko avoid kiya jaye. Iske liye apko enough antioxidants consume karna hoga. Tarbooj aur iske juice me antioxidants rich hota hai. Iska sewan apko diseases se nijat dilayega. Tarbooj lycopene ka best dietary source hai. Ye ek powerful antioxidant hai, oxygen radicals ko neutralize karta hai. Jo Beta-carotene aur vitamin E se bhi better hai. Iske sewan se breast, prostate aur endometrial cancer risk reduce hota hai. Ise apni daily diet me add karen. Ye cancer se fight kar apko healthy life jeene me help karta hai. Cardiovascular disease ke karan deaths bhi ho sakti hain. Cardiovascular disease ka cholesterol content main risk factor hai. Tarbooj heart ko healthy banane ke liye best food hai. Isme potassium ki presence ke karan aisa hota hai. Potassium ki ye amounts heart rate aur blood pressure ko control karti hai. Isse hm heart disease aur strokes se protect hote hain. Tarbooj me calcium aur potassium rich hote hain. Ye body ki kidney se toxins ko out karne me help karte hain. Calcium ke karan cell functions regulate hote hain. Isse cell structure maintains hota hai. Extra calcium blood me uric acid ko reduce karta hai. Uric acid ki decreasing se tarbooj me calcium aur potassium jidney diseases ko reduce karne me help karta hai. Tarbooj me water bhi high hota hai. Isse hame urination bhi frequent hota hai. Aur hamari kidney properly work karti hai. Absorption disturb hone se main problem constipation ki hoti hai. Isse stool hard hojata hai aur use passing me problem aati hai. Waise constipation ke many causes hote hain jaise medication, lack of fiber intake, poor diet, illness etc. Every day plenty of water len. Tarbooj me water aur fiber-rich hota hai. Ye juicy fruit easily digestive system ko proper karta hai. Asthma problem hone se patients me unki bronchi highly sensitive hoti hai. Jo log high amount me nutrients lete hain unme asthma problem kam hoti hai. Ye nutrients jaise vitamin C hota hai jo many fruits aur vegetables or tarbooj me paya jata hai. Isliye asthmatic patient ko tarbooj ka sewan karna chahiye. Tarbooj hairs ke liye very beneficial hai. Isme vitamins, minerals aur antioxidants ki presence se hi aisa hota hai. Ye good source of vitamin C hai. Iske seeds bhi rich in vitamins, magnesium, iron, potassium, zinc, copper, calcium, omega-6, aur manganese hote hain. Ye all nutrients apke hairs ko long aur lustrous banata hai. Sweet hote hue bhi tarbooj calories me low hota hai. Isme fat aur cholesterol nahi hota. Iske alawa isme citrulline hota hai jo body me essential amino acid ko arginine me convert karta hai. Arginine high level se body me fat store ko reduce karta hai. Isse cardiovascular function proper hota hai. Tarbooj weight loss me help karta hai. Many peoples thought ki milk aur calcium hi bones ko strong banate hain. Lekin atrbooj me present lycopene se bhi bones healthy hoti hain. Ye oxidative stress ko reduce karta hai. Lycopene hamari body me protective effect dalta hai. Aur hamari bones ko damage hone se rokti hai. Luckily tarbooj me lycopene aur calcium hota hai. Ye sono ise superfood banate hain jo hamari bones se love karta hai.